Seven new species were found. 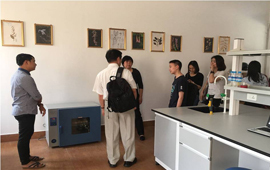 On 15th March 2018, GEI in china visited CAS-SEABRI (Myanmar Office) which is situated in Forest Research Institute, Yezin, Nay Pyi Taw,Myanmar. Dendrobium naungmungense, a new species from Naungmung, Kachin State, North Myanmar, is described and illustrated. Streptocephalus sirindhornae Sanoamuang et al., 2000 is reported in Myanmar for the first time, and Streptocephalus shinsawbuae sp. n. is described as new.